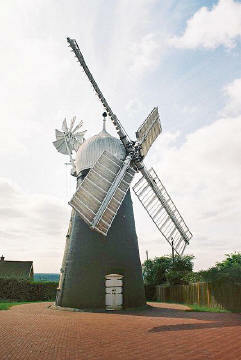 Ellis's Mill is an excellent surviving example of a small tower mill and dates from 1798. There has been a mill on this site from at least the middle of the 17th century. It is now the sole survivor of nine windmills that formerly faced west over the steep slopes of the Lincoln Edge. The first known owner of the mill was Anthony Meres, a wealthy landowner. It went through a succession of owners until December 1894 when John Ellis bought the mill for £250. He died in 1920, but his wife and son successively retained ownership until 1973. The mill was worked until the 1940s when the machinery was removed and it fell into dereliction. Tragedy struck further when a fire finally destroyed all of the remaining woodwork in 1974. The Lincoln Civic Trust acquired the mill in March 1977 and set about its restoration. First, the tower was cleaned and the floors and cap re-constructed. It was then necessary for replacement parts to be found that fitted the dimensions of the existing tower. The cap mechanism was acquired from 'Subscription Mill' in Sturton-by-Stow, the stones and drives from 'Eno's Mill' at Toynton-all-Saints. The sails and fantail were built and erected by Thompson and Co, millwrights from Alford. The mill was finally completed in 1980 and on Sunday 26th April 1981, Ellis's Mill ground its first flour for 40 years. The Mill is still in full working order and provides flour, subject to sufficiently windy days! The mill is now managed by Lincolnshire County Council but would not run without the group of devoted museum volunteers who help maintain, staff and promote the site. Should you visit, it will be some of these volunteers who guide you around the mill. SK 971723 OS Sheet - 121. In Mill Road, Lincoln, near Cathedral and behind Museum of Lincolnshire Life, Burton Road, B1398. May to September, Saturdays & Sundays, 14.00 - 18.00. October to April, Sundays 14.00 to dusk. Booked parties by arrangement at other times, which may be combined with a visit to the Museum of Lincolnshire Life.